View our large selection of .500 inch shank diameter hexalobular rotary broach sizes. View our large selection of 8mm shank diameter hexalobular rotary broach sizes. 8mm shank diameter x 28mm overall length hexalobular micro rotary broach sizes. Do you need to make a precision six lobed/hexalobular form in the end of a metal shaft or fastener? 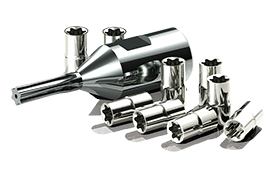 Creating a six-lobe (torx-style) form in fasteners and other driven parts is ideal due to the high amount of contact between the tool and the part. The six-lobe form has many names. The most popular version is a trademarked type know as Torx®. However, additional varieties found in the marketplace are known generically as six-lobe, star, and hexalobular internal driving feature. Hexalobular style rotary broaches or wobble broaches can be made to any dimensions you will provide, but are typically only effective in machining smaller diameters and depths. The six lobe form is popular in sizes under 1/4″ diameter for screws in a variety of industries including aerospace, automotive, finished construction, medical and plumbing. Many standards are published to standardize six lobe dimensions. For example, one industry standard is for inspecting the hexalobular driving feature. (ISO 10664-2005) For more information, please see the ISO standards. The rotary broach is designed to be used with a rotary broaching tool holder in any type of turning machine. Custom and standard six lobe hexalobular broaches are available from Polygon Solutions. Our broaches are designed to meet the international ISO hexalobular standards.